MSS' Pick and Hold Module is designed to apply an initial higher voltage to the coil for a pre-determined period of time and then drop the voltage to a pre-determined percentage of the initial value through pulse width modulation to avoid over heating the solenoid coil. The above voltage sequence will be applied to the coil when a voltage (2 to 40 VDC) is applied to the trigger. The trigger voltage can be a secondary voltage (external trigger) or the same voltage used for input voltage (internal trigger). 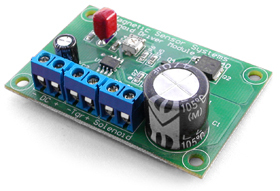 This is particularly useful when a solenoid requiring a relatively large amount of power needs to be turned on and off with a low power trigger voltage such as a TTL compatible signal. * Pick time can be made longer in factory on special orders. ** Holding voltage is preset in factory at 30% of input voltage. This value can be adjusted with the potentiometer on the board.